Let’s take a quick look at these two new paintings by Sanjay Verma, both of underrated, early Detroit Tiger stars. The cards made from these paintings will be high numbers in our R319-Helmar art set. 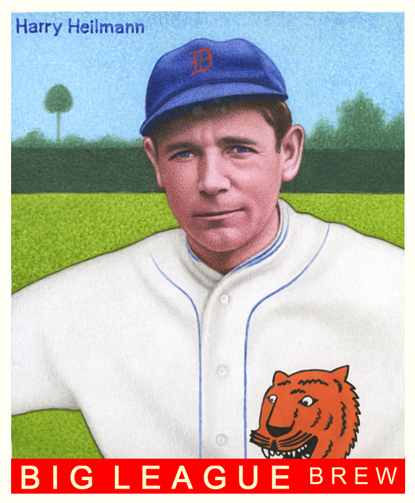 The first painting is of Harry “Slug” Heilmann, who roamed Tiger outfields from 1914-29. Heilmann, who enjoyed a lifetime .342 batting average, had four single seasons with averages between .393 and .403. Not bad. He is depicted in his 1927 road duds, the only season this particular design was used. It was also the first campaign in 22 years that did not have Ty Cobb on the team. Along with being a Detroit legend as a player, Cobb had also managed the team for the previous 6 seasons. He had been forced to leave under somewhat shady circumstances, so perhaps once more a uniform change indicated a change in team direction. I am mystified why the style lasted only one year; the Tiger head logo brought some color to the field. Perhaps it was felt that the tiger didn’t appear ferocious enough; the animal does look a bit ill. The second painting is of Heilmann’s teammate and fellow outfielder Bobby Veach. 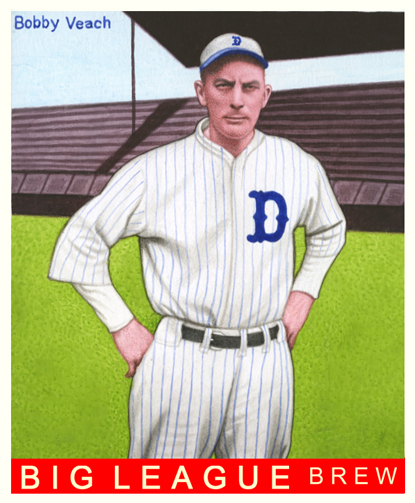 Veach played all but two of his 14 years in Detroit, finishing there in 1923. For the life of me I can’t understand why Veach isn’t more valued among collectors. He had a .310 lifetime average, for cripes sakes, and led the league several times in important categories. Over the 1913-23 years, which were the years in which he was a starting player, he led the majors in runs batted in. I suppose it is partially because his career inconveniently fell between the collecting booms of the 1909-15 and early 1930’s eras. Anyway, he is pictured in this high numbered card with his 1920 home uniform. The stylized “D” chest logo was used from 1918-20, though the combination with the white cap would place it definitively at 1920. Heilmann and Veach, each pleasant men, got along well until the 1921 season. In that year, new manager Ty Cobb instructed Heilman, then 26, to regularly yell at and insult the older Veach (33). The general idea seems to have been that the goading would inspire Veach, known as very easy going, to new heights of play. Cobb promised to reveal the plan, and Heilmann’s reluctant part in it, at the end of the season. It was a successful plan, at least partially. Veach batted .338 with 128 runs batted in. However, Cobb refused to own up to the ploy at the appointed time. Veach refused to believe Heilmann’s story and held a deep grudge against him for years afterward. Both men retired to the Detroit area after their playing days were over, with Veach eventually owning a coal company.